I heart onigiri. 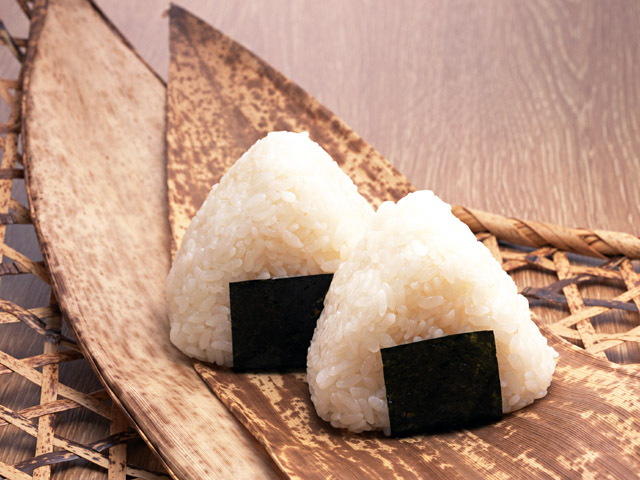 For those that are unfamiliar with onigiri, it is pronounced like “oh-knee-gee-ree”. I’ve heard a few people pronounce it differently and it ends up sounding like some racist slur. yikes! This food has nothing to do with racism… it’s basically a triangular ball of rice/salt, usually filled with some sort of seasoned food, and wrapped with seaweed. Dee-LISH, boys and girls… DEE-LISH. My grandparents passed on their appreciation for this simple Japanese “dish” when I was young. While I am still not at the level of Akari sensei, my grandma was able to teach me how to form the triangular rice balls. The image of her shaping the rice and salt mixture with her old, wrinkled hands is something that will stay with me forever. I would sometimes tag along with my grandpa when he did the gardening at my uncle’s house, and one of the best things was eating lunch that grandma packed: a sandwich and onigiri – the best combo! Many love them filled with umeboshi, but I’ve never been a fan of the famous pickled plums. Blech!! I love them with either tsukemono or konbu. They’re great for picnics, hikes, sack lunches, or something to take to potlucks. Anyway, I stumbled upon this video about onigiri production in Japan. They have a machine! I guess this is cheaper than hiring a bunch of Japanese grandmas to make thousands of rice balls each day. I love how the Onigiri boy has a face mask in the factory… hah! What do you like in your onigiri?? love the mascot in the video. but what was said about the air ventilation in the triangle shaper in the machine? I found another video about onigiri! Just take it the way you might take an article from The Onion though. haha! awesome. love the trainer! !